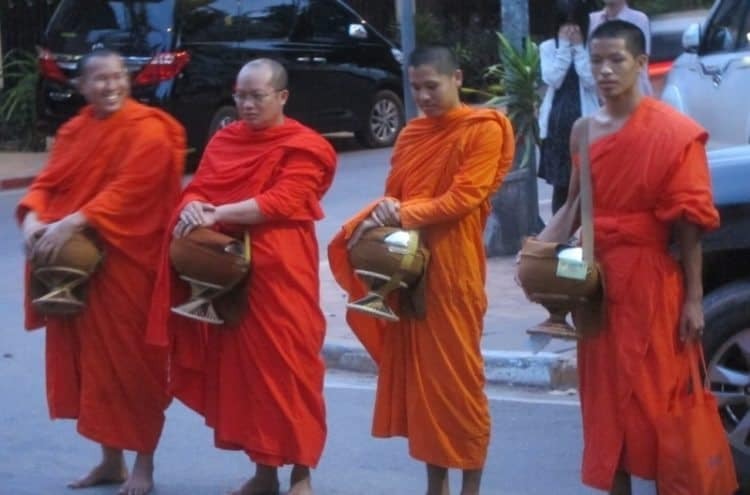 Tak Bat: Monks reciting dharma in Vientiane, Laos. James Dorsey photos. On many streets, early in the morning, you'll see these monks. In the black velvet hours before dawn, Vientiane, Laos awakens slowly and softly. The crush of cars and motorbikes has not yet started; the stifling heat of midday is still hours away, and the brightly lit monasteries shimmer like Christmas ornaments. It is a city coated with religious fervor. It is also the time when the deep indigo of the sky clashes with candlelight and the brilliant saffron robes of an ancient ritual that is a photographers dream. It is time for Tak-Bat. Laos is a deeply Buddhist country whose temples and monasteries dot the map like holes in a dart board. 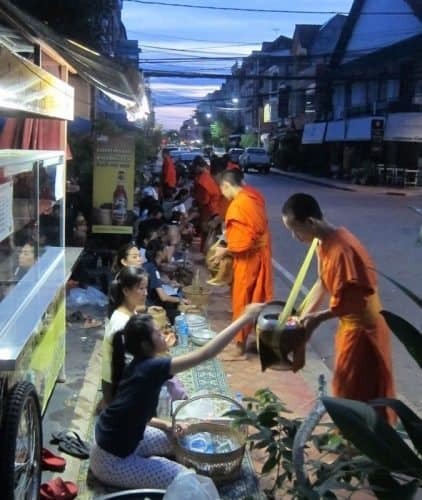 It is a land of politeness and smiles and the people you meet just before dawn are carrying offerings for Tak Bat, the ritual of almsgiving to monks. The life of a Buddhist monk is austere. For many, it is the only path out of a life of poverty and the only means for obtaining an education. A majority of the male population becomes a monk, at least for a limited time. For many families it is a matter of face, a tradition passed down through generations, for others, it is a temporary curiosity, while for most it is a sacred calling. One is not required to remain in the religious life but may return to the secular world at will before any final vows are recited. In countries like Laos, monks are revered. Giving alms to deserving monks in Laos. In Sanskrit, as many of the old texts are written, monks are called Bhikkus and they vow to follow a set of 227 rules that prohibit harming all living things, stealing, sexual misconduct, gossip or malicious language and the use of alcohol or drugs. They are also not allowed to eat or handle money after midday. In the early days of Buddhism, before there were monasteries, monks were wandering mendicants who literally relied on the kindness of strangers for their daily bread, or rice in this instance. Tak-Bat descends from that time. It is the perpetuation of an ancient tradition and ceremony of the people feeding their religious leaders. The Buddhism of Laos follows the path of Theravada which means, “Teaching of the Elders.” It is one of three main branches of Buddhism that originated in northern India and Nepal in the sixth century B.C. and rapidly spread throughout Southeast Asia until it was introduced to Cambodia and Laos in the 13th century via monks from Sri Lanka. It is a personal religion that worships no deity but rather teaches self -control in order to release all attachment to the material world and achieve personal enlightenment. More than any other countries in Asia the people of Laos seem to embody the spirit of Theravada with their guileless personalities, self -effacing manner, and unending friendliness. Being in the presence of their monks is like being covered with butterflies. 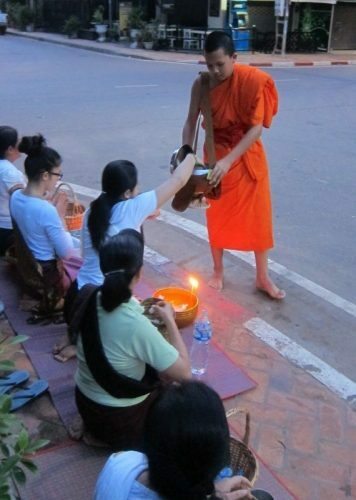 An important aspect of all schools of Buddhism is alms giving, and this is a daily routine across Laos, but it is taken to a new level each day on the streets of Vientiane. 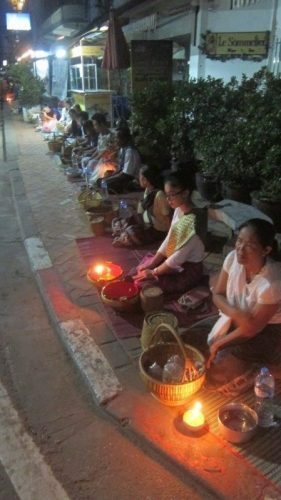 Across the city, lights come on shortly after midnight as people begin to prepare the local favorite of sweet sticky rice, sometimes laced with raisins, wrapping it in grape leaves to be eaten later with bare fingers. Children are sent outside to collect fresh flowers. Monks lining the streets of Vientiane, Laos. As the first pink rays of dawn streak the sky, the people are already in place, lining the curbs outside of the cities’ 80 monasteries. Many kneel in the gutter, most sit on the curb as it is disrespectful to have ones’ head higher than a monk. Thousands of candles illuminate the morning streets giving the effect of an outdoor church. In some places, the streets are lined three deep with people waiting for the monks. They have baskets filled with offerings. Besides the sticky rice, some have money, bananas, flowers, or bottles of water. Most are silent but many chant quietly while waiting for the monks to arrive. They have come to gain good karma for their next life. Just before dawn, thousands of monks venture forth, in single file, oldest in the lead followed in descending order down to the youngest. All have shaved heads and are barefoot to show their humility. They usually travel in groups of ten to fifteen, each holding a rice bowl, some of which are quite elaborate while others are simple and utilitarian. The bowls are usually gifts from their families upon their entry to the monastery and vary in value and quality depending on the wealth of the contributing family. They are carried in a leather sling hung from the shoulder with a cover over the top. The monks are resplendent in their saffron colored robes that catch and accentuate the morning light making them seem to glow and no religious procession is more colorful. The simplicity of their beauty merging with the fervor of the people creates religion as a gorgeous spectacle. One by one they file past the people sitting on the curb, who touch their offering to their forehead in deference before placing it in the monks’ bowl. No one speaks. There are no please or thank you’s as it is considered to be a religious ceremony, and women are careful not to touch the monks as it is forbidden by ancient tradition. It is a silent and solemn procession practiced with great dignity by all parties. Whatever the monk receives, that is all he will get to eat for the day. The public is welcome but is asked to observe certain rules. No one should stand taller than the monks and flash photography is forbidden. Modest dress is required, meaning no bare arms or short shorts. Silence is maintained so as not to interrupt the meditative state of the monks. Never grab them or their bowls and as they pass, a slight bow of the head shows respect. While no one will physically enforce there rules, it is simple common courtesy to the culture being visited. This traveler admits to standing slightly higher than the monks in order to photograph for this story but I secreted myself between two potted trees on the patio of an outdoor restaurant and I am quite sure no one ever realized that I was there. I shot without a flash and would never intentionally disrespect such a ritual. When every pilgrim has given his or her offerings the monks will line up abreast directly across from the largest gathering and chant from Buddhist Dharma and once finished they silently head back to their respective monasteries to begin a day of labor, usually raking leaves first thing to show humility for what they have just received. For a Christian, it would amount to a priest saying a prayer of faith after being given a gift. Tak-Bat is a baring of the soul of the Laotian people that anyone can witness or even participate in if they have a good heart.